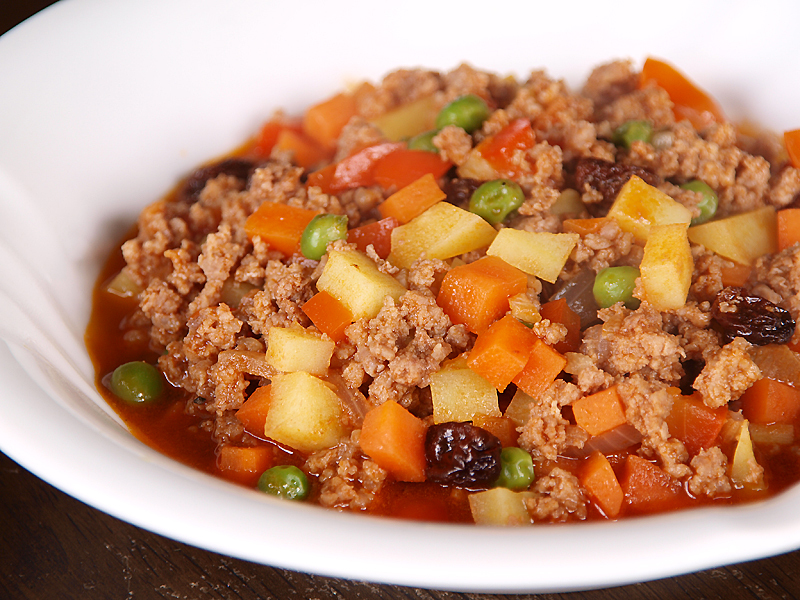 Menudong giniling is a dish that was derived from the dish called Menudo, ingredients are nearly similar but the preparation is different, in the normal Menudo meat and other ingredients are cubed into 1cm pieces while in this dish everything is way much smaller and minced meat is used. Taste is also nearly similar so it’s just a matter of choice so I leave it up to your preference which one would you choose. For me I love both but they serve different purposes, Menudo is for those who loves liver as it is one of its key ingredient while Menudong giniling in my personal opinion is good for visual presentation as raisins and green peas looks better in this recipe because it has nearly the same size as the other ingredients. In a pot add oil then sauté garlic and onions, once onions are soft add minced pork and mix until brown. Add stock, tomato paste, vinegar, soy sauce, sugar, potatoes, carrots and bay leaves. Bring to a boil then simmer for 10 minutes. Add green peas, raisins and capsicum then simmer for 10 more minutes. i saw menudo & i had to swing on over here! this reminds me so much of my grandma. i can smell her cooking right outta the computer screen. i must make this one day! With vinegar added, one of those I will enjoy as anything sour is my fav although need to change the type of meat. this is gorgeous…my hubs love this.. I like your version with pork better. Looks great. I think that if I edited out the raisins think I might be able to smooch this recipe past the fussier members of our family… In act I think I might try and do just that very soon (well, as in handing recipe to Himself) but you know what I mean LOL. I definitely prefer ground pork from liver (unless if it’s duck’s fat liver 😉 ) so this version would be my favourite. I find the raisins’ presence very original! Ibang klase ha. Nadenggoy ko mga kaibigan ko kasi mega praise sila sa niluto kong recipe mo! Ayos! You still add the raisins or you just eat the raisins? Apologies I forgot to add it the method. Anyways I rectified it, Thanks.